"The evangelist of entrepreneurship" (The Economist) reveals the true stories about how a range of entrepreneurs created their successful start-ups: hint, many of them never began with a business plan.Business schools teach that the most important prerequisite for starting a business is a business plan. Nonsense, says Carl Schramm in Burn the Business Plan, who for a decade headed the most important foundation devoted to entrepreneurship in this country. 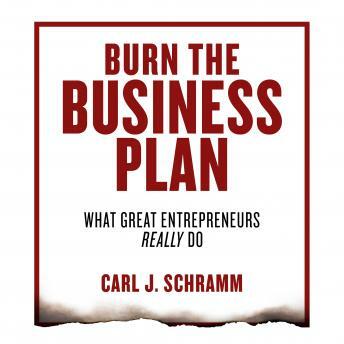 Microsoft, Apple, Facebook, and Google are just a few of the companies that began without one.Schramm explains that the importance of a business plan is only one of the many misconceptions about starting a company. Another is the myth of the kid genius-that all entrepreneurs are young software prodigies. In fact, the average entrepreneur is thirty-nine years old and has worked in corporate America for at least a decade. Schramm discusses why people with work experience in corporate America have an advantage as entrepreneurs. For one thing, they often have important contacts in the business world who may be customers for their new service or product. For another, they often have the opportunity to strategize with knowledgeable people and get valuable advice.Burn the Business Plan tells stories of successful entrepreneurs in a variety of fields. It shows how knowledge, passion, determination, and a willingness to experiment and innovate are vastly more important than financial skill. This is an important, motivating look at true success that dispels the myths and offers invaluable real-world advice on how to achieve your dreams.